Storm Legion Beta is here ! 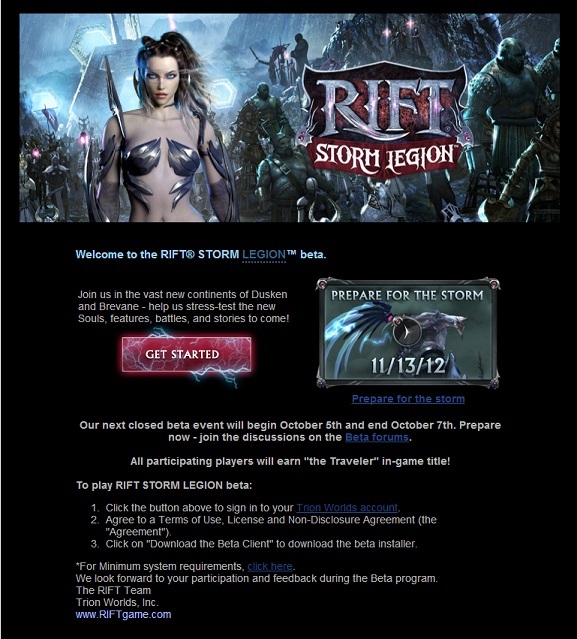 The first Closed Beta event for Storm Legion is starting on the 5th of October and it’s going to last until the 7th. Everyone that pre-ordered Storm Legion was invited to this event and can sign up for it by logging it to the their Trion Worlds account. Once you join you can start downloading the Beta client (which is going to take a while for those with slow connections ) and you will also gain access to the Beta forums (which unfortunately are under NDA so until I get a heads up from Trion I can’t post anything !). So if you haven’t pre-ordered Storm Legion yet, do so and hop on the Beta wagon ! If not, stayed tuned for the new Rogue soul reveal this Friday ! Storm Legion Release Date Announced ?!!! Rift Universe: Will there be a Storm Legion Beta? If so when? Rift: Dev Tracker: What to expect for Callings in RIFT: Storm Legion!